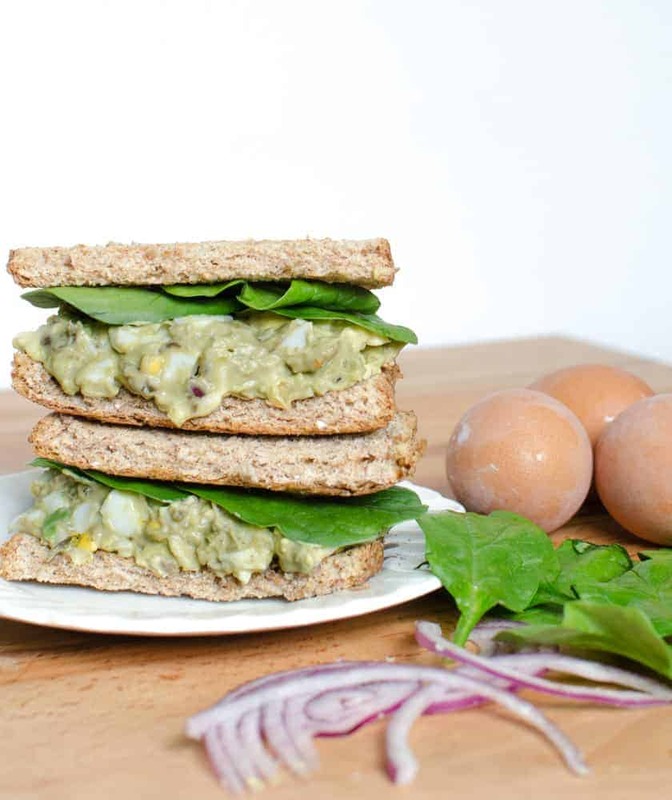 Quick and delicious Avocado Egg Salad recipe is a game changer! It’s healthy and perfect on bread, crackers, in lettuce, or in a pita. Healthy lunch recipes are it’s best. 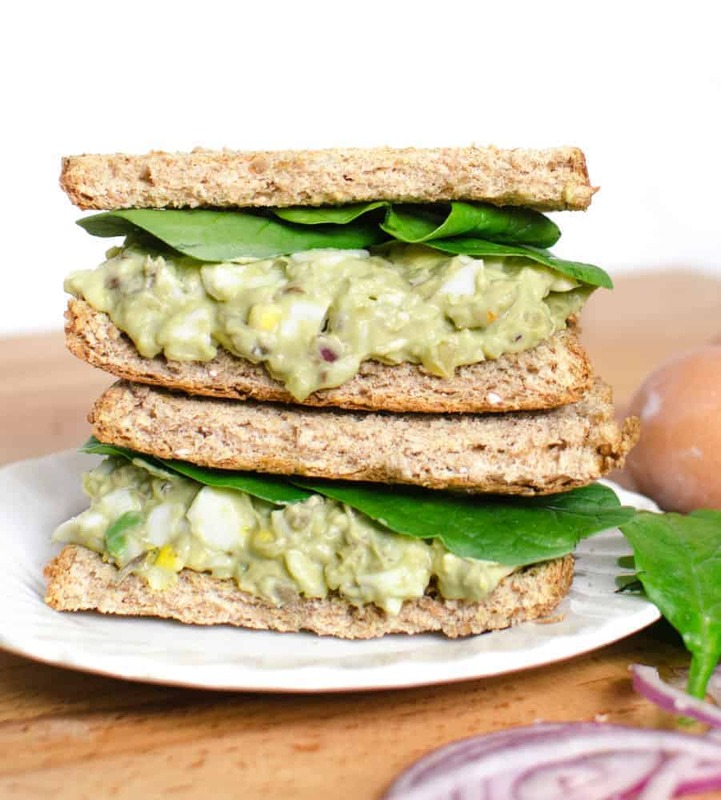 Avocado Egg Salad is the perfect recipe for today! Today is St. Patrick’s Day and this food is a great naturally green dish and Easter is in just a week and a half which means you’ll have lots of boiled eggs on your hands. So make this recipe today and again in 2 weeks and you’ll be glad you did. 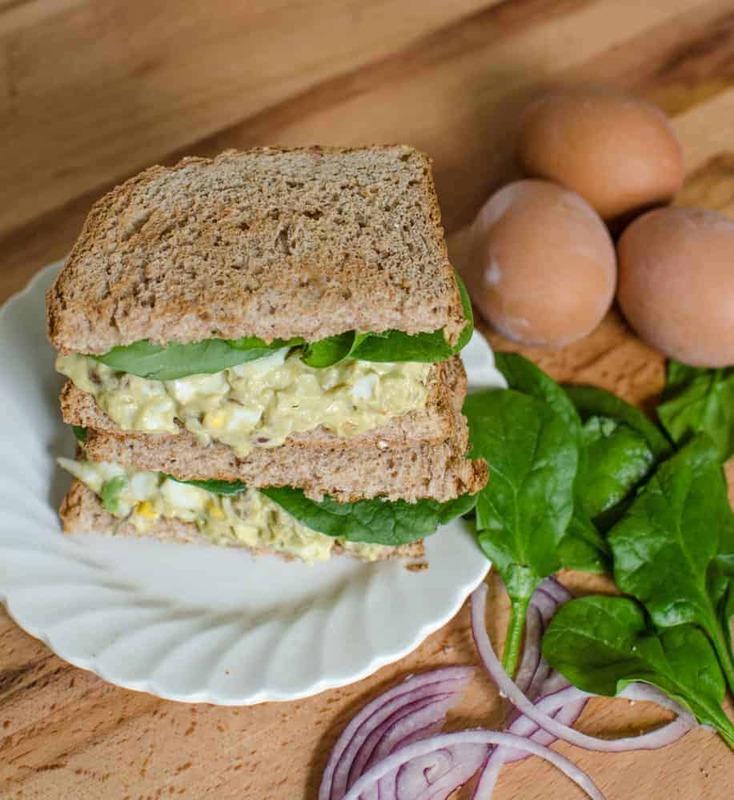 I love all things avocado and my family loves egg salad. This is one of those “best of both worlds” kind of recipes. Thomas was working at the house the day that I made this so I got a plate ready for him, packed up the little boys, and went to pay him a lunch delivery visit. I was excited to see what he’d say about the Avocado Egg Salad. He started eating while we were talking and the boys were playing and then he stopped midsandwich to ask me what I’d made. I explained and he said, “This is the best egg salad I’ve ever had, and you know how much I love normal egg salad. You should probably never make normal again.” I told him I was going to quote him on the blog because it was a great review. So there you have it, it’s awesome, straight from my foodie of a husband. I made a green salad with lots of chopped romaine and spinach, shredded carrots, and some pickles and then put a scoop of the avocado egg salad on top. It was a really delicious meal. It would also be great in my favorite homemade whole wheat pitas. With all the fat and protein this dish has too, it really keeps you full and satisfied for a long time. The little people loved it too which is always nice. This is great served on toasted whole wheat bread, on crackers, in a lettuce wrap, or on a bed of salad greens. I think you could leave the mayo out but that little bit really makes it taste like a traditional “salad” and I recommend using it. A little goes a long way here. Don’t be skimpy on the salt and pepper, they really bring out the flavors in this dish. Tip on how to cut the avocado: Cut the avocados in half, remove the pit. While holding one half in the palm of your hand (flesh up) use a butter knife to slice the avocado into chunks (while it’s still in the skin, use the knife to cut is a few times from the top to the bottom and then cut it again from side to side, making little squares out of the cut lines). Then use a spoon to scoop the cut flesh from the skin/shell. It’s all chopped and ready to go, just scoop it right into the bowl! How do you ripen avocados quickly? 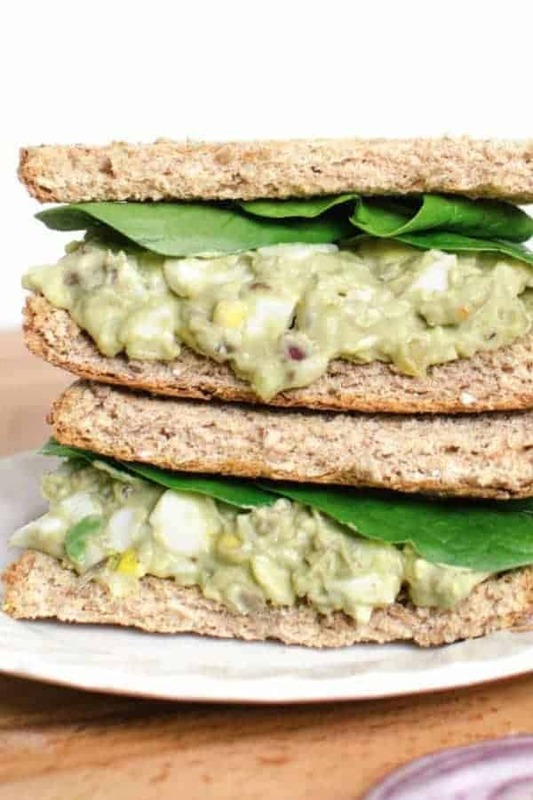 One method to speed up the avocado ripening process is to place unripe avocados in a brown paper bag with an apple or banana for two to three days until they are ripe. Peel and rinse the hard-boiled eggs to remove any extra shell pieces. Place the eggs on a cutting board and give them a rough chop to cut them into small pieces. Place them in a medium bowl. Remove the peel and pit of the avocados and give them a rough chop, add them to the bowl. Add the may, onion, sweet pickle relish, salt and pepper, and hot sauce, if using. Stir to combine. Taste and adjust seasonings. Can’t wait for you to try these. Enjoy, from my kitchen to yours! Yes. Just yes. Last week my sister was frantic for avocado recipes because she had like, 5 ripe avocados and this would have been perfect! I was a little skeptical at first but, I made it and I love it. I will definitely be making it again. You should try making your own mayonnaise and use avocado oil. 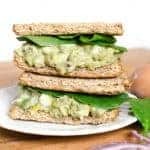 It has a slightly green tint and tastes amazing with egg or tuna salad instead of regular mayo. I’ve been buying avocado oil more and more in the last 6 months and am really liking it! I’ll definitely try that, it sounds wonderful!